Interview with Oscar and Emmy nominated Director, Producer and Writer John Singleton of "Empire, Fast and Furious". 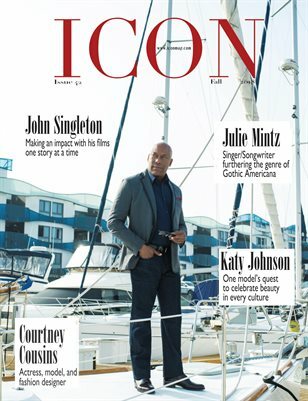 Interview with Singer/Songwriter Julie Mintz releases her new album titled, "All hope of fruition".Interview with Actress and Model Katy Johnson. Coverage from NYFW by Meera Fox. Interview with Model, Reality TV Star, and Fashion Designer Courtney Cousins. "Southern Charm", editorial by Aliona Kuznetsova. "Ice Blue Sky", men's editorial by John Martinotti. Article, "What is a Cheagan"? "Cook like me, look like me", by staff writer Serah Blackstone-Fredericks.